We all need to learn how Chile has been able to do this – I want to know how they’ve done it – they are already mobilized, getting people out of structures, getting assessments made, providing immediate health services for people injured during the quake, already setting up the food, water and shelter systems that will be needed and less than twelve hours after the quake they were doing it. We haven’t seen that happen that way in the United States and I want to know what we need to do to get it right the way they are doing right now. Please tell me how they have managed to put so much of this in place before hand and what our country needs to do for the same thing to happen when we have disasters. So far, after hurricane Katrina – changes were made but if there were an earthquake anywhere in the US – we would unfortunately resemble what happened in Haiti and numbers of days, even weeks before aid gets to people – even aid that was already in place, even aid that was sitting on the tarmac. – and now Haiti customs wants to tax the donated goods coming in and not give them to the people of Haiti. It is obviously true that some countries have their act together when it comes to extreme events of human disaster and tragedy. Italy was very well organized after L’Aquila, the armies that came in to help after the tsunami in December 2004, were exemplary in some countries and disorganized in others. It is possible that at the very least, we can all do something that resembles this organized and immediate response rather than a bungling horror or secondary tragedy from bureaucratic incompetence that has occurred during other disasters, whether hurricane, flood, earthquake, volcano, or tsunami. We’ve all seen the secondary traumas and human tragedy that occurred and are occurring in Haiti as a direct result of poor handling of resources that were made immediately available. To have paid for and sent so many of our world leaders to classes, seminars, workshops, UN sponsored information resource conventions and conferences, etc. ad nauseum – it is ridiculous that any country would be disorganized in the way Haiti was in its capital recently after the earthquake. It is remarkable to see the efforts in Chile that are immediate and organized to help the people of Chile, to retrieve them from damaged buildings and to get to outlying areas that have been affected. I wish the United States towns and cities could respond that well . . .
Amazing. So far, it is an intelligent and coordinated response. And the preparation of using earthquake resistant design, technologies and building methods is extraordinary considering the loss of life that would have otherwise occurred and the physical harms that could have left the population in Chile with the same injuries that have been seen in Haiti – which were absolutely horrific. There are scenes coming in right now on CNN from the tsunami hitting in Huatulco, Mexico on an IReport. – most of the above surfcams seem to be taking a long time loading or are offline altogether. I think checking YouTube and IReport might be a better choice. El buscador de internet Google lanzó un servicio para localizar a personas en Chile, tras el terremoto de 8.8 grados que azotó al país andino durante la madrugada del sábado, en el que los usuarios tienen la oportunidad tanto de buscar a sus seres queridos como de proporcionar información sobre personas desaparecidas. 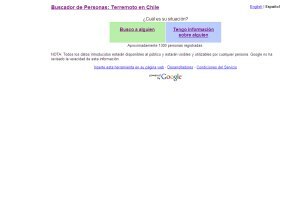 Mediante la página http://chilepersonfinder.appspot.com/?lang=es, el servidor pregunta en primera instancia cuál es la situación del usuario, que pude elegir entre “Busco a alguien” y “Tengo información sobre alguien”, para después proporcionar los datos de la persona. Para buscar, sólo hace falta introducir el nombre o parte del nombre de la persona, mientras que los que tienen información pueden registrar el nombre, la dirección, la descripción, fotografía y un mensaje. Hasta el medio día, se encontraban registradas mil 200 personas a este servicio, que, sin embargo, advierte que: “todos los datos introducidos estarán disponibles al público y estarán visibles y utilizables por cualquier persona. Google no ha revisado la veracidad de esta información”. ** Evacuation maps can also be found in the white pages of your phone book.